Artist Michael Alford arrives at his studio on an industrial estate in Wandsworth between eight and nine in the morning and often departs when the light fades. 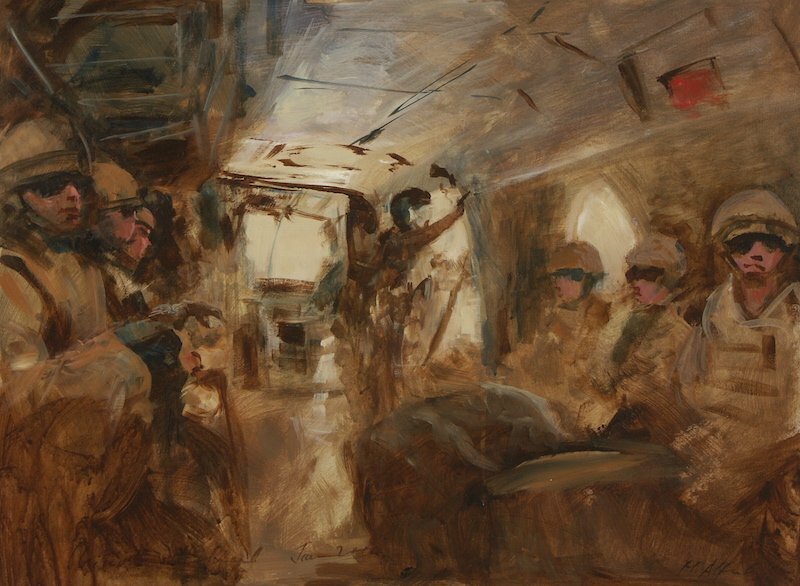 It’s an unusually disciplined routine for an artist, but then, as a war artist Alford is no stranger to shift work. Such regularity does not run through his artwork, however, and as I wandered around his studio full of mainly figurative or urban landscapes paintings, I noticed that his style varies from one canvas to another. ‘The galleries want me to produce paintings to order,’ he said, ‘but I just can’t do that. If I am to develop and keep freshness, each painting has to be different – a challenge. I know one artist who paints nothing but deckchairs…’ His voice trailed off. Once he had agreed to go he set about the rather tedious business of preparation and jumping through the Ministry’s hoops of checks, inoculations, measurement for body armour and insurance. ‘The actual journey to Kandahar is quite surreal. You take off from RAF Brize Norton, which is rather like any other airport and you arrive at Kandahar which is in effect a huge American city.’ The next stage was the flight to Camp Bastion, another military town set in the middle of Afghanistan. ‘It is a town where you feel completely safe,’ he says. What about artistic kit, did he carry much with him? ‘No, I just relied on watercolours, pencils, cameras and a sketch book – it all had to be mobile. The oil paintings were completed when I returned to Wandsworth. The regiment commissioned a painting that now hangs in the officers’ mess in Wellington Barracks’.